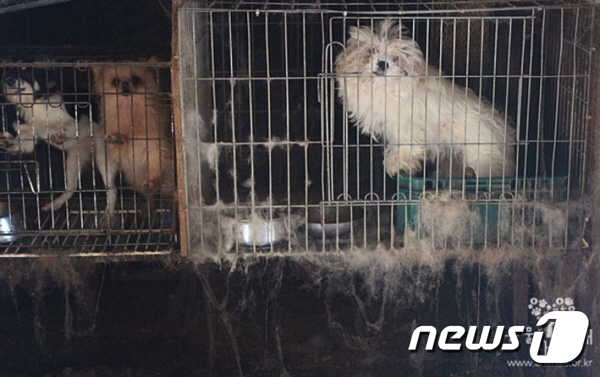 Photo: Illegal puppy mill in South Korea. Korean Animal Welfare Association (KAWA). It is important for us to remember that what we do for the Korean dogs and cats matters and makes a difference. On December 27, 2017, Korean News1 reported that several changes are being made to improve animal protection in 2018. Unfortunately, these changes will not affect the dogs in the dog meat industry. However, this is proof that the Korean government is under pressure and they realize that they need to start taking action to improve the welfare of Korean animals. Below is a summary of the changes as stated in the article. Beginning March 22, 2018, the requirements for an animal production business will transition from a notification system to a license system. In order to obtain a license from a local government, the animal production business must meet specific requirements with regards to both the facility and personnel. If caught operating without a license, the business will be fined 5 million Korean won, in accordance with Article 46 of the Animal Production Act. Four companion animal related industries – animal exhibition (such as an animal cafe), pet hotel/day care, grooming, and transportation (such as an animal taxi) – will be added to the Animal Protection Act. Registration with the local government is required to operate any business falling within the definitions of these industries. Therefore, the Animal Protection Act will increase the number of companion animal industries, which currently includes animal production, import, and cremation, to 7. Using animals for the purposes of gambling, such as a dog fight; as prizes or promotional items; or for commercial purposes will now be regarded as animal abuse. Punishment for such animal abuse will be strengthened from imprisonment for up to one year or a fine of up to 10 million won to imprisonment of up to 2 years or a fine of up to 20 million won. Beginning March 21, 2018, there will be new measures to help resolve the animal abandonment problem. The fine for abandoning an animal will increase from less than one million won to less than 3 million won. News1 also reported about a new requirement that when importing animals designated as natural treasures, the Cultural Heritage Administration must be notified.